Share the post "Evil Eyes"
It’s been just 24 hours since we were pounded by yesterday afternoon’s thunderstorm, and after driving down some of the streets today and seeing all the big limbs and fallen trees, I became all the more thankful it wasn’t any worse than it was. Someone told me the airport reported winds at 70 miles per hour during that storm, but after looking at the amount of destruction we had, I’d say there must’ve been gusts much stronger than 70 mph. What I thought to be the strangest was seeing how many branches appeared to have been twisted off. It’s always been said oak trees are the most storm resistant, but I also noticed some healthy limbs of oak on the ground. So much for the mighty oaks. It sounds like we’re supposed to be getting another storm this evening, and I truly hope there won’t be those damaging winds this time around because there’s much time needed to get yesterday’s mess cleaned up before we can begin to face another. I’m afraid it’s going to be a repeat of yesterday because of how thick the air has been with humidity. The number of appointments outside my office certainly kept me out in the heat. I shook my head in disbelief when seeing a handful of young men out running in it. I guess they must’ve wanted to get really good and dehydrated. Back a number of years ago when I used to run, I’d never go out in the middle of the day, but rather early in the morning or towards sunset. Some may like getting fried, but I don’t. This would be a great evening to spend in one of our City’s parks. Flowing water and lots of shade would make for a memorable evening. I could see myself seated on the stone retaining wall in East Park with my shoes off, trousers rolled up, and dangling my feet in the coolness of Willow Creek. I was reminded again today that summer isn’t going to last forever. Before you know it, we’ll be at the threshold of Fall. With it already Thursday evening, I’m beginning to wonder where the week went. Yes, I’ve been exceptionally busy, but it still seems to have gone too fast. Next week is also going to be hectic with the new listings I’ll have coming on. At least I’ve got most of the back-end prep work done which is oft times the most time consuming. Did you know that we have more than just raccoons, opossums, and rats living in our City’s storm sewers? Most don’t realize that we even have wild cats living down there. Every once in a great while I’ll spy a cat either crawling up out of one, or dropping back down. 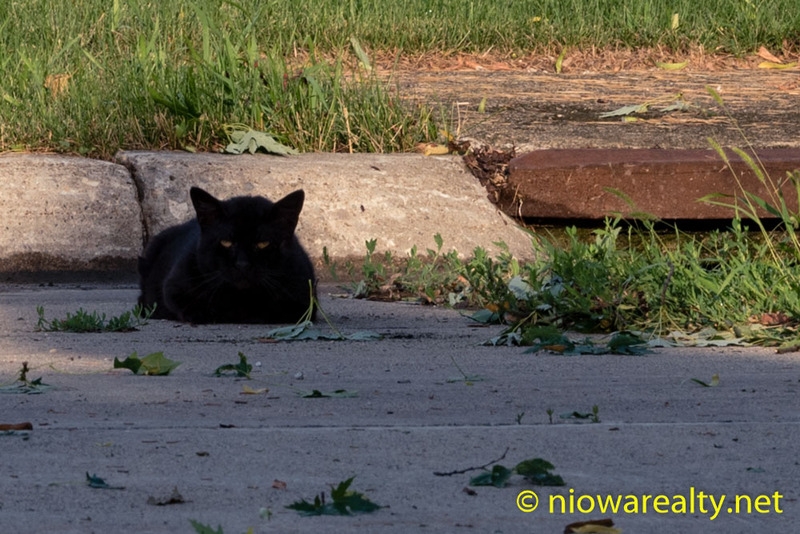 The above photo is of a semi-wild cat who’s taken up residence in one of our City’s storm sewers. I’ve seen it coming up out of it more than once. It does have evil eyes.